John Watts (1755–1801) was a Royal Navy officer. He served as a midshipman in Resolution on James Cook's third voyage to the Pacific in 1776–1780. In 1787–1789, while on leave from the navy, he sailed as a passenger on Lady Penrhyn with the First Fleet to New South Wales, and acted as supercargo on the return voyage to England via Canton. Extracts from Watts's journal of the First Fleet voyage appear in The Voyage of Governor Phillip to Botany Bay, as do three plates after his sketches. ^ Robson, John (2014). "John Watts (1755–1801)". Captain Cook Society. Retrieved 2015-01-04. Phillip, Arthur (1789). The voyage of Governor Phillip to Botany Bay : with an account of the establishment of the colonies of Port Jackson & Norfolk Island / compiled from authentic papers which have been obtained from the several departments. To which are added, the journals of Lieuts. Shortland, Watts, Ball & Capt. Marshall with an account of their new discoveries. John Stockdale. Admiral Arthur Phillip was a Royal Navy officer and the first Governor of New South Wales who founded the British penal colony that later became the city of Sydney, Australia. 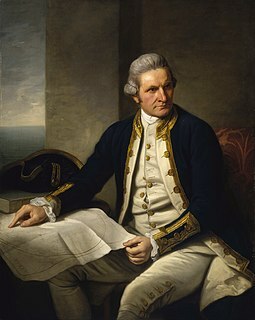 Vice Admiral John Hunter was an officer of the Royal Navy, who succeeded Arthur Phillip as the second governor of New South Wales, Australia and served as such from 1795 to 1800. Sydney Cove is a small bay on the southern shore of Sydney Harbour, one of several harbours in Port Jackson, on the coast of Sydney, New South Wales, Australia. Borrowdale was a three-masted, square rigged merchant ship, launched in 1785, that served as a storeship of the First Fleet, a convoy of 11 ships taking settlers and convicts to establish the first European colony in Australia. She was wrecked in 1789. There are 20 known contemporary accounts of the First Fleet made by people sailing in the Fleet, including journals and letters. The eleven ships of the Fleet, carrying over 1,000 convicts, soldiers and seamen, left England on 13 May 1787 and arrived in Botany Bay between 18 and 20 January 1788 before relocating to Port Jackson to establish the first European settlement in Australia, a penal colony which became Sydney. At least 12 people on the Fleet kept a journal of their experiences, some of which were later published, while others wrote letters home during the voyage or soon after their arrival in Australia. These personal accounts of the voyage were made by people including surgeons, officers, soldiers, ordinary seamen, and Captain Arthur Phillip, who commanded the expedition. Only one known account, that of James Martin, was by a transported convict. Their journals document the day-to-day experiences of those in the Fleet, and record significant events including the first contact between the European settlers and the Aboriginal people of the area. In 2009, the manuscript journals were included in The Australian Memory of the World Register, a regional register associated with the UNESCO international Memory of the World programme. Arthur Bowes Smyth was a naval officer and surgeon on the First Fleet that established the colony of New South Wales. Smyth kept a diary and documented the natural history he encountered in Australia. Silver Beach is a 2.8 km long west-trending sand spit in Kurnell, New South Wales located 18 kilometres (11 mi) south of Sydney CBD. Situated on the northwestern reaches of the Kurnell Peninsula and linked with the sandstone of Sutherland Point in the east, the beach is characterised by silver-coloured sands, hence the name, and 14 rockwall groynes which project into Botany Bay. The eastern point of the beach is the site where Captain Cook first set foot on Australian soil in 1770, which marked the beginning of Britain's interest in Australia and in the eventual colonisation of this new "southern continent".